NY Times reports a suicide attack on a historic Christian church in northwestern Pakistan killed at least 75 people on Sunday, in one of the deadliest attacks on the Christian minority in Pakistan for years. The dead included women, children and two Muslim police officers who had been posted outside the church. Witness reported scenes of mayhem as rescue workers ferried victims from the church, which witnesses said was scattered with body parts, shrapnel and bloodied clothing. 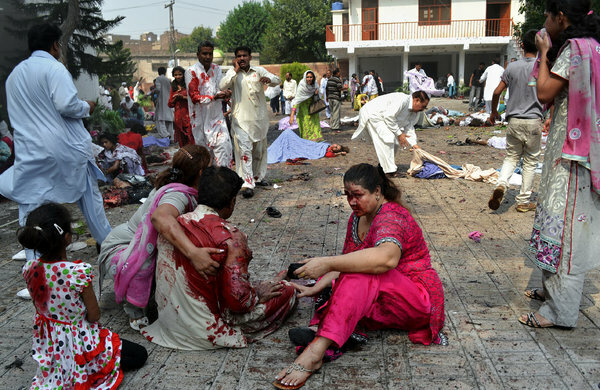 Enraged Christians reacted emotionally as police and rescue workers reached the scene, forcing some to leave. “As soon as the service finished and the food was being distributed, all of a sudden we heard one explosion, followed by another,” said Azim Ghori, a witness. Police said it was not clear whether the attack was the work of a lone attacker or two suicide bombers. Muhammad Ilyas, a senior officer in Peshawar, said it was “more likely” that a lone suicide bomber had first thrown a hand grenade before detonating his vest.